In this review we feature the best LED Bluetooth speakers with lights that create a dazzling lightshow and deliver superb sound quality at the same time. These speakers are equipped with LED lights that cycle through multiple colors and look really stunning – they are perfect for outdoor parties and gatherings where your friends and family can listen to music and enjoy the LED spectacle as well. Furthermore, these LED speakers are equipped with acoustic drivers that deliver crystal clear sound quality with good volume, and can easily fill up a room or outdoor environment with rich music sound quality. They are also designed to be portable and come with built-in long lasting battery life for long continuous music playtime. If you are looking for LED Bluetooth speakers with lights that can spice up your home entertainment, be sure to check out our top picks below! The JBL Pulse 3 is one of the best LED Bluetooth speakers with lights that combines 360 degree sound performance with a dazzling lightshow. 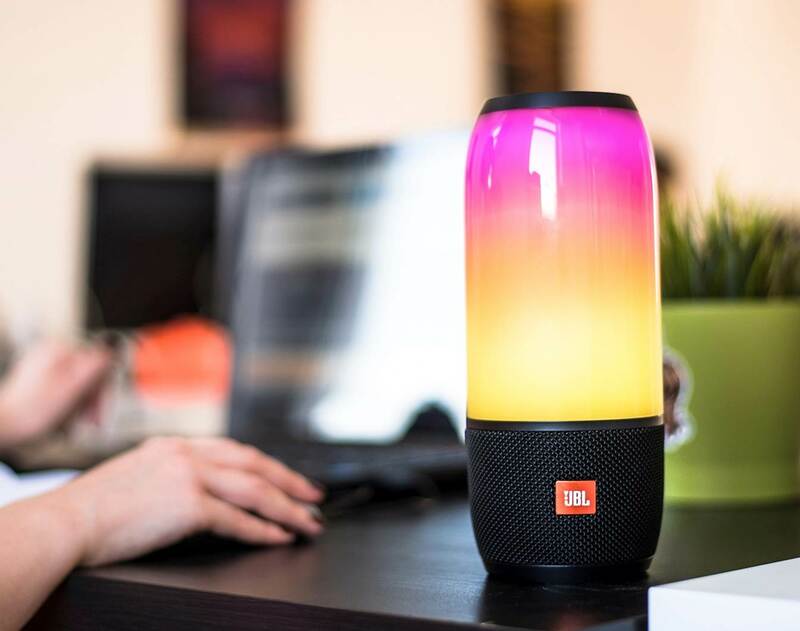 The JBL Pulse 3 comes with a customizable 360 lightshow that cycles through multiple colors and looks really stunning. It also comes with a built-in rechargeable battery that delivers up to 12 hours of playtime on an IPX7 waterproof housing, which makes it ideal for listening on the beach or poolside. The speaker also features JBL Connect technology which allows you to link multiple JBL speakers together to create a wider soundstage. It also features a noise and echo cancelling speakerphone which allows you to take calls from your speaker at a touch of a button. We also liked the fact that you can shake the JBL Pulse 3 to create a synchronized lightshow with other Pulse 3 devices, and customize the lightshow with the JBL Connect app. If you are looking for one of the best LED Bluetooth speakers that have a great combination of sound quality and a dazzling lightshow, the JBL Pulse 3 comes highly recommended. The sound quality of the JBL Pulse 3 is very good, with crystal clear stereo sound and balanced bass. We liked the fact that you can set the sound on the equalizer on the JBL Connect app according to your individual music preferences. The speaker delivers 360 degree surround sound and can easily fill up a large room with rich and filling sound quality. We also liked the fact that you can really turn up the volume on the JBL Pulse 3 speaker without hearing any distortion which is great. Bass-heavy music genres such as electronic dance music and rock and hip-hop sounded genres sounded really lifelike through the speaker and well-presented. The speaker delivers crisp highs, nice midranges and deep low tones that feel deep and punchy. The bass does not muddy into the midrange frequencies and stays where it should be as bass, which helps the music to come across as well-textured and layered. In terms of the sound performance, we would say that the JBL Pulse 3 performs better than any other LED Bluetooth speaker we have tested. 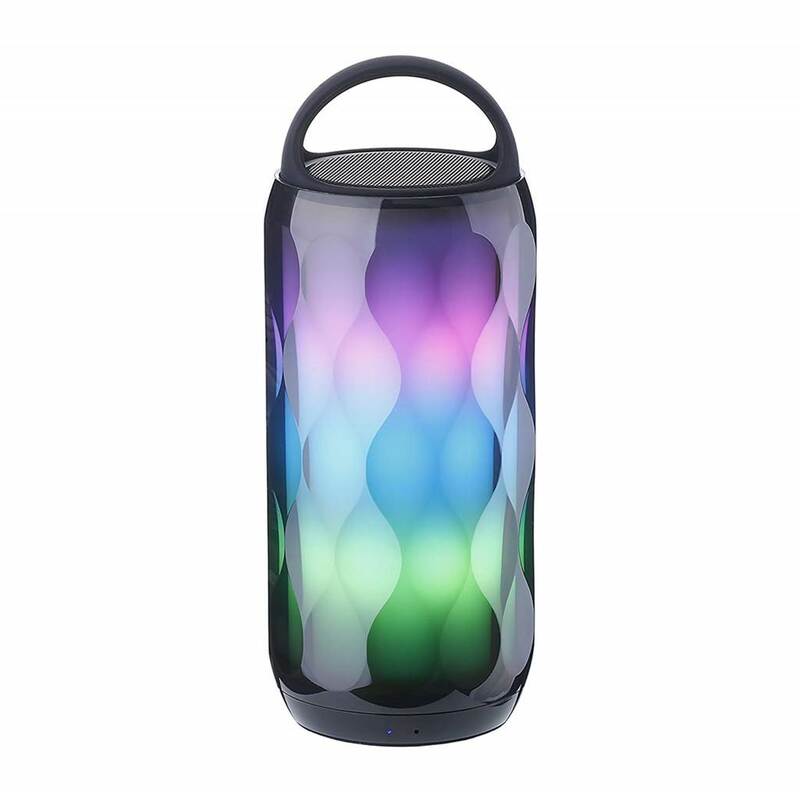 The JBL Pulse 3 comes with a very sleek and modern looking design with vibrant LED colors. The pairing of the JBL Pulse 3 to the mobile device was really fast, and there is an input for auxiliary connections if required. The light button on the Pulse 3 has 8 light modes – wave, rainbow, fire, camp, equalizer, rave, jet and your own customized option. We really liked the fact that you can customize the LED lighting on the Pulse 3 using the JBL Connect app. The JBL Pulse 3 allows you to connect up to 2 smartphone or table devices while playing music. It also comes with a built-in 6000mAh rechargeable battery that provides up to 12 hours of continuous music playtime on a single charge. Furthermore, the JBL Pulse 3 is IPX7 waterproof which provides resistance to rain, spills or immersion into water. It also comes with a built-in noise and echo cancelling speakerphone which allows you to take calls on your speaker with a touch of a button. The Verdict? The JBL Pulse 3 is one of the best LED Bluetooth speakers with lights that provides great sound and a visually stunning LED display. The LED speaker provides a 360 degree LED lightshow which cycles through multiple color modes and looks visually stunning. It also delivers 360 degree surround sound performance which is ideal for outdoor parties and gatherings. The sound quality that we got from the JBL Pulse 3 is exceptionally clear, detailed and pristine. The highs and midranges are smooth and very nicely reproduced, while the mid-range and bass performance hits hard and feels very deep. Music genres including electronic dance music and rock music sounds very vibrant through the Pulse 3, and you can hear the beats literally dance to the LED light waves. We also liked the fact that the JBL Pulse 3 comes with a built-in rechargeable battery that delivers up to 12 hours of continuous music playtime with an IPX7 waterproof housing. Overall, it’s one of the best LED Bluetooth speakers with lights that you should definitely consider for outdoor or indoor music listening. The MIANOVA LED Bluetooth speaker with lights is a really versatile and sleek speaker with RGB color-changing LED lights. This Bluetooth speaker supports all Bluetooth devices and also includes auxiliary line-in, TF card and USB connections. The speaker comes with an integrated chip that provides 6 different LED color changing themes and also supports manual light changes automatically. The MIANOVA speaker can provide up to 10 hours of continuous music playtime with the LED lights off, and 8 hours of playtime with the LED lights active. It features a high quality 2000mAh li-ion battery. The sound quality on the MIANOVA LED speaker is really good, and delivers robust true 360 surround sound with decent bass output. It comes equipped with Bluetooth 4.2 technology for high quality music streaming and works with virtually any Bluetooth enabled music source. It also features true wireless technology which enables you to pair two Bluetooth speakers and the same time for full stereo output. Overall, the MIANOVA LED Bluetooth speaker with lights delivers a good combination of LED visual displays, sound quality and versatility and we highly recommend them. The sound performance of the MIANOVA Bluetooth speaker is really crisp and clear. The sound quality is great for large to medium spaces and it pumps out quality audio performance with room-filling sound. The sound has a surprising amount of bass with crisp and clear treble ranges – the timbre ranges are very good and vocal performances sounded smooth without any harshness. The bass hits surprisingly hard and goes pretty low, which adds a significant punch to music performances. You can also crank up the volume to maximum levels on this speaker with virtually no distortion which is great. Music genres with more bass and beats sounded very fun and enjoyable to listen to on this speaker, with very good details and clean punchy beats that provide an immersive listening experience. The speaker is finely tuned to provide a good sound experience both indoors and outdoors and they are great for poolside or beach parties. While the sound quality on the MIANOVA is not as full as the JBL Pulse 3, it really delivers a tonne of volume output and crystal clear vocals which more than make up for it. The MIANOVA LED Bluetooth speaker looks really sleek and visually stunning with a tonne of LED light colors. It is equipped with a TF card reader, USB flash disk, auxiliary-in and TWS for versatility. The front panel of the speaker provides easy operation to play, pause or change volume levels at the press of a button. 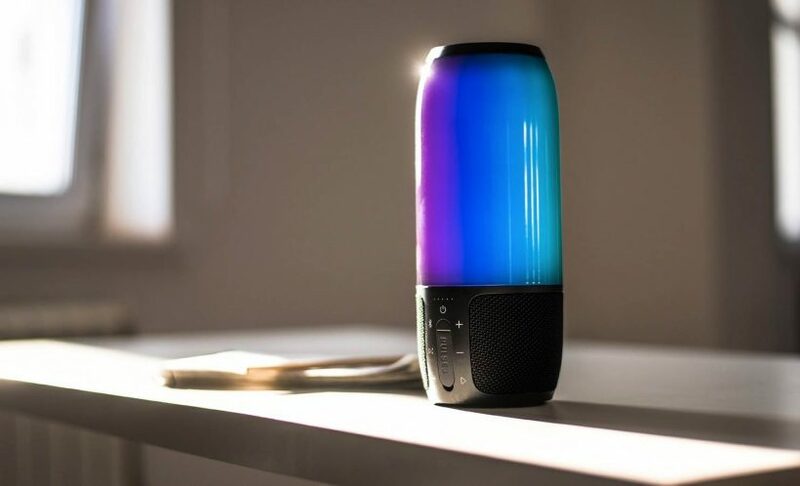 The speaker has a built-in chipset that provides 6 different color-changing themes; you can also choose any color you like or let the LED patterns oscillate automatically. The entire speaker is very portable and easy to carry – it has a compact side dimension of 3” x 5.7” and weighs under 15 ounces. We also liked the fact that the speaker features true wireless stereo (TWS) functionality which allows you to use two speakers together to create a wider stereo soundstage. The speaker uses Bluetooth 4.2 for high quality music streaming and is compatible with virtually all Bluetooth-enabled devices. It also features an integrated amplifier chipset with ACF functionality which significantly improves sound quality. The Verdict? The MIANOVA LED Bluetooth speaker with lights is a highly versatile and compact speaker with visually stunning lights and good quality sound. The speaker is designed to be really versatile and compact – it supports all Bluetooth audio devices as well as auxiliary line-in, TF card, USB and hands-free speakerphone calls. 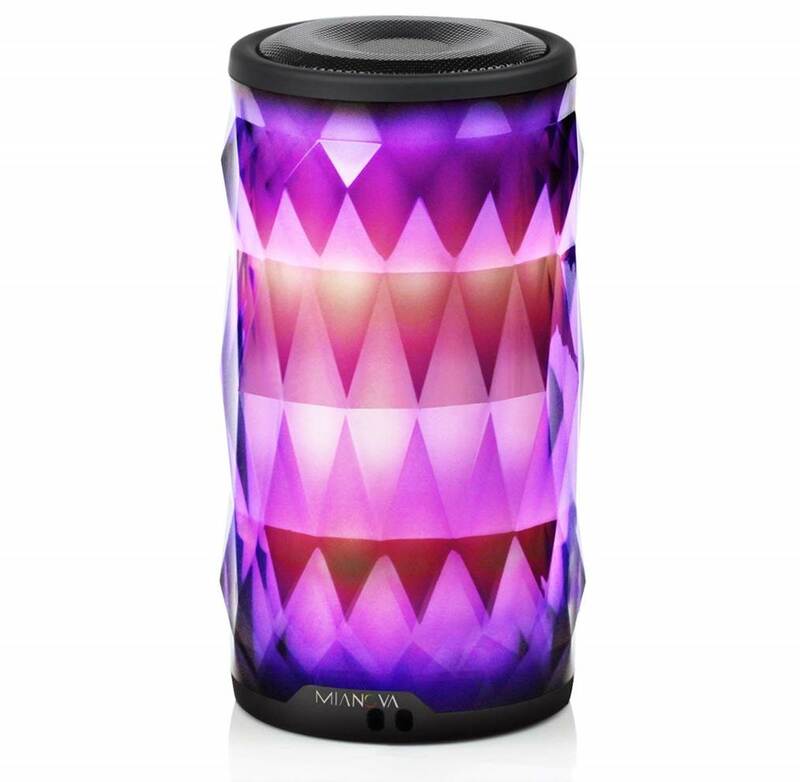 The MIANOVA speaker comes with an integrated chip with RGB light changes that provide 6 different color changing themes. The speaker supports up to 10 hours of continuous music playtime with the LED lights off and has a high capacity 2000mAh li-ion battery. The sound quality that we got from this speaker was crisp, clear and very detailed with a surprising amount of bass output. The speaker also has visually stunning LED colors that deliver a lightshow with 6 different color changing modes and also allows you to customize the lighting options. On the whole, the MIANOVA speaker is one of the best LED Bluetooth speakers with lights that really deliver quality sound performance with a visually stunning display and we highly recommend them. The VersionTech LED Bluetooth speaker with lights is a high-quality stereo speaker with visually stunning LED lights in a unique diamond shaped design. The speaker is capable of producing stereo sound quality and comes with built-in acoustic drivers that provide a wide audio spectrum. The sound quality on this speaker is really good and it delivers crisp highs and deep bass without any distortion at high volume levels. This LED speaker is equipped with Bluetooth 4.1 for high quality music streaming and is compatible with virtually any Bluetooth-enabled device. The entire speaker has a lightweight and portable size with a dimension of 5.9” x 5.9” x 5.1” and weighs a mere 1.1lbs which makes it easy to carry. You can store the speaker directly on your backpack or take it with you while travelling. The VersionTech speaker comes with a built-in 1200mAh rechargeable battery that provides up to 8 hours of continuous music playtime together with a built-in memory chip for playback functionality. We liked the fact that this speaker comes with built-in 6 color rainbow LED lights which provides a visually stunning LED display. If you are looking for a LED Bluetooth speaker with visually stunning lights and a unique design, the VersionTech speaker is a great choice. The sound quality of the VersionTech speaker is surprisingly good considering how compact the speaker actually is. The speaker produces a tonne of volume and can go really loud without any distortion. Music performances sounded crystal clear through this speaker with very nice highs, clear midranges and deep bass performance. The sound quality is very clear and vocal performances are reproduced with good accuracy. We did not experience any harshness or dips in sound quality while streaming music via Bluetooth. Music genres such as country folk and jazz performances sounded really good on the speaker, and it has a clean sound reproduction with great attention to detail. The bass on the speaker is decent and provides an added punch to music performances, although do note that the bass output may be limited due to size constraints. Apart from this, the speaker delivers sound quality that is very enjoyable to listen to and works well for any music genre. The VersionTech has an LED display on the top which gives the speaker a really unique appearance. The speaker’s built-in LED lights changes intensity and rhythm to the beat of the music and gives the effect of making the music come to life. The entire speaker is designed to be wireless and ultra-compact, and is easy to connect your mobile device with Bluetooth functionality. It comes with a built-in battery that supports up to 8 hours of continuous music playtime on a single charge and can be charged via a USB power source. The speaker contains two acoustic drivers with a power of 3W each and can deliver pretty good stereo sound quality. The speaker also supports TF card in addition to wireless Bluetooth streaming. The entire package comes with the Bluetooth speaker, charging cable, remote and user manual for easy reference. The Verdict? The VersionTech speaker is one of the best LED Bluetooth speakers with lights that delivers a visually stunning display of colors with really good sound performance. The speaker is equipped with two 3W speaker drivers that provide a wide frequency response and good stereo sound. Music genres such as country folk and vocal performances sounded really good through the speaker with good attention to detail and crisp timbre ranges. The bass that the speaker produces is decent although you should adjust your expectations accordingly due to the size of the speaker. 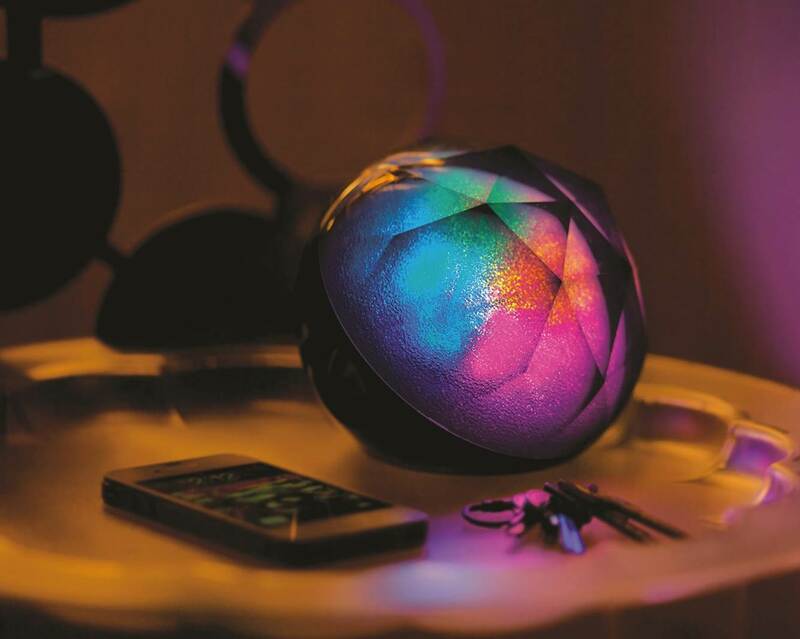 The VersionTech speaker delivers a colorful display with 6 LED colors and the intensity of each color changes to the beat of the music. The speaker has a unique diamond shaped appearance and is lightweight and portable – it has a dimension of 5.9” x 5.9” x 5.1”. On the whole, the VersionTech speaker is an LED Bluetooth speaker with lights that delivers really good sound and a stunning LED display of colors. 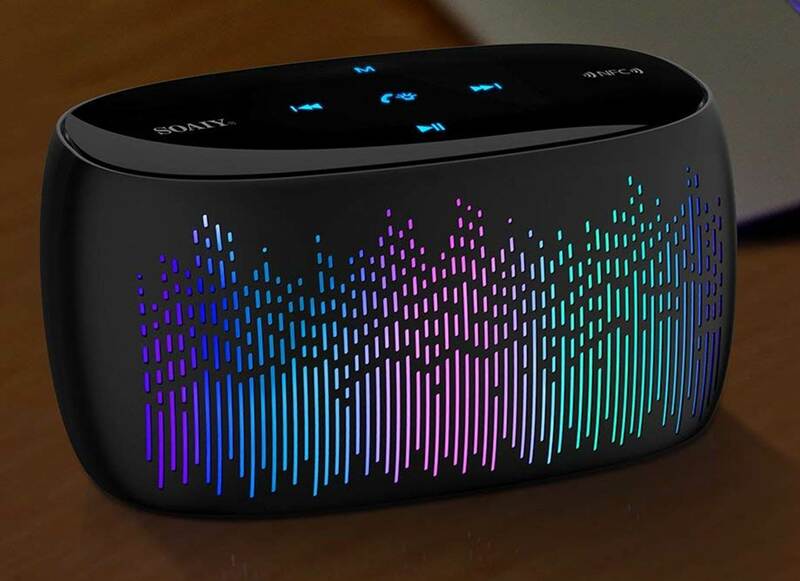 The SOAIY S52 LED Bluetooth speaker is a visually stunning speaker with 11 LED display modes and pulsating LED lights. The speaker comes with built-in 28 RGB LED lights which can create lightshows with different modes including color waves, starry sky and equalizer. The speaker delivers really good sound performance and comes with a 10W full-bodied stereo with dual high-performance drivers with 7W rated power and enhanced bass response. The SOAIY S52 speaker also has a built-in 2000mAh rechargeable battery that provides up to 7 hours of continuous playtime and recharges in under 3 hours. We liked the fact that the speaker also features sensitive touch controls which allow you to change the volume, soundtracks and LED lighting modes with a touch of a button. This speaker is designed to be lightweight and portable, and is suitable for outdoor or indoor use. If you are looking for a small but heavy duty LED Bluetooth speaker with lights, we highly recommend the SOAIY S52 Bluetooth speaker. The sound performance of the SOAIY S52 speaker is really good considering its small and compact size. It can produce a lot of volume and go pretty loud – we cranked up the volume to maximum on the S52 speaker and it produced virtually no distortion. The speaker is able to produce up to 10Ws of full-bodied stereo sound with decent separation and crystal clear details. Music performances sounded surprisingly clear any volume level, and you can hear the subtle notes and details in the music with good clarity. The highs and midranges are well-defined and accurate, while vocals and dialogue sounded open and smooth without any harshness. The speaker delivers really smooth sound quality and does not produce any harsh overtones or distortion. The bass on the S52 speaker is decent and does not overwhelm the other frequency ranges – do note that the bass may not be as powerful as expected due to small size of the speaker but it adds a layer of punch to the music quality. If you are looking for a portable speaker that can produce really crisp stereo sound quality, the SOAIY S52 speaker is the one you should get. Apart from the sound quality, the SOAIY S52 speaker has a sleek and modern looking design with a matt-black finish. The speaker comes with illuminated touch controls on the top and has a micro-USB charging port at the bottom of the speaker. The S52 speaker supports wireless Bluetooth connectivity with NFC pairing. It also has a built-in microphone for you to take hands free calls on the go. The grille has a lightshow that is powered by 32 multi-colored LED lights with 11 selectable patterns. The lights also double as a 32-segment volume indicator which is really cool. The touch controls at the top of the speaker are illuminated and the center indicator also functions as a charge status indicator. We really liked the fact that the speaker comes with a 2000mAh capacity battery that provides up to 7 hours of continuous music playtime with the LED lights switched on. The entire speaker is designed to be compact and portable with a rubberized texture and feels really nice to carry in the hand. The Verdict? The SOAIY S52 is one of the best LED Bluetooth speakers with lights that creates a stunning lightshow with a compact and portable design. The speaker comes equipped with 10W full-bodied stereo drivers that produce crisp and clear sound quality with enhanced bass response. It has 11 nice visual LED display modes and has built-in 28 RGB LED lights that cycle through the display to create a stunning pattern and lightshow. The speaker is built for portability and looks really nice when used at night – it makes for a great conversation piece as well. The sound quality that we got from the S52 speaker is crisp, clear and very well-defined with good attention to detail. The bass response from the S52 speaker is decent although not as powerful as expected due to the small compact size. The speaker also has a built-in 2000mAh battery that delivers up to 7 hours of playtime on a single charge. Overall, the S52 is one of the best LED Bluetooth speakers with lights and we highly recommend them. The NULED Flame LED Bluetooth speaker with lights is an ambient lighting speaker with 60 LED lights and a stunning lightshow display. The entire speaker comes with a matte finish with an elegant design and is IP65 waterproof which makes it ideal for both indoor and outdoor use. The LED lighting on this speaker produces a warm yellow light that forms a stunning flame visual when combined together. The speaker delivers really good stereo sound performance with 5W output – you can also connect two speakers together to create a much wider soundstage. The speaker uses CSR 4.0 Bluetooth for high quality music streaming and you can connect the speaker to your smartphone or tablet devices. The speaker comes with a built-in rechargeable 3600mAh battery and charges via the micro USB port. The speaker also come with a built-in UNC threated hole on the bottom which allows it to be installed on walls or wall mounts with a strong magnetic base. Overall, the NULED Flame is an excellent LED Bluetooth speaker with lights and is definitely worth checking out. The sound performance of the NULED Flame LED speaker is surprisingly good considering its size. The speaker can produce really good bass and pump out plenty of volume without any distortion. The highs and midranges sound really crisp on this speaker, and the bass response is strong enough to add a layer of punch to bass-heavy music genres. We tested the speaker with music, audiobooks and movies and it works well with good sound quality. The flame LED lights also add good ambience to the outdoor environment which we placed the speaker in. Music performances such as country folk and jazz sounded very rich and clear through the speaker, while vocal performances were crisp and well-defined. The stereo sound performance of the NULED speaker is pretty decent and you do get really clean sound that feels rich and clear. The best thing about the NULED Flame LED Bluetooth speaker is the flame LED light effect which it gives out. The flame LEDs look visually stunning and the speaker can also be mounted to a wall with a standard ¼” threaded tripod or with the included mounting hardware. You also have the option of either playing music with the LED lights turned on, or using the speaker without the LED lights. The entire speaker has a matte-black finish together with a rugged and splash-resistant design. It can fit inside your backpack easily and taken along with you for camping or pool parties. The speaker uses Bluetooth 4.2 for high quality music streaming and allows you to connect to your mobile device from up to 30 feet away. The speaker also has IP65 waterproof resistance which makes the speaker suitable for exposure to outdoor water elements, although the speaker should not be submerged underwater. The Verdict? 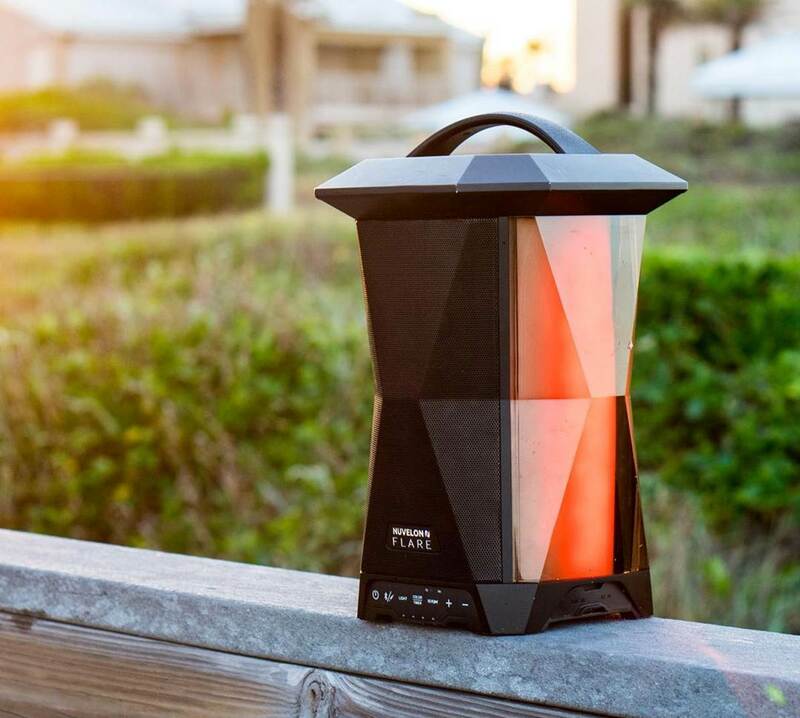 The NULED Flame is one of the most visually stunning LED Bluetooth speakers with lights with a 5W stereo output. The speaker features 60 LED lights that combine to produce flame effect that looks really beautiful and visually impactful. It comes with a matte black finish and an elegant design with IP65 waterproof resistance. The speakers provide true wireless stereo functionality and you can even connect two speakers together to create a much wider sound-field. The speaker provides reliable Bluetooth 4.2 for high quality music streaming and works very nicely straight out of the box. The speaker comes with a built-in rechargeable battery with a capacity of 3600mAh and a micro USB charging port which is included. The speakers can also be installed or mounted on the wall with a built-in ¼” UNC threated hole at the bottom. The sound quality of this speaker is surprisingly good, and it delivers crystal clear sound quality with good attention to detail. Overall, the NULED Flame is one of the best LED Bluetooth speakers with lights that we have tested and we highly recommend them. The Samesay LED Bluetooth speaker with lights is a portable and visually stunning speaker with 7 LED visual light modes. It features a pre-programmed dynamic multi-color light from romantic to beat dance flashing styles that offers a spectacularly colorful experience – it is perfect for creating an excellent atmosphere for parties, yoga and outdoor barbecues. The sound quality on the Bluetooth speaker is really good, and delivers plenty of volume output with nice vocal performances. The Samesay speaker comes equipped with Bluetooth 4.0 for high quality music streaming and is compatible with virtually all Bluetooth enabled devices including iPhone and android with a range of up to 33 feet. The Samesay speaker has an ultra-portable design with a slim and lightweight body, which means that you can take it everywhere you go or for travel. It also comes with a built-in battery with a capacity of 800mAh and provides 3-5 hours of continuous music playtime on a single charge. We also liked the fact that the speaker has a built-in microphone for you to take hands free calls on the go. Overall, the Samesay LED Bluetooth speaker is a really stunning looking speaker with vibrant lights and good sound performance. The sound performance from the Samesay Bluetooth speaker is nice and crisp with decent volume levels. The speaker can pump out quite a lot of volume despite its small and compact size – music performances sounded really crisp and detailed with the speaker, and vocal performances were clear and smooth. The acoustic driver on the speaker can produce quite a lot of volume and you can crank up the volume to maximum without hearing any distortion. The speaker comes with digital signal processing which helps improve the overall music quality. The bass from the Samesay speaker is nice and punchy and delivers an improved low-end. That being said, do note that the bass on the Samesay speaker may not be as punchy due to the speaker’s compact size. Apart from this, the sound output quality and stereo response on this speaker is crisp and crystal clear, and we enjoyed listening to the speaker in both indoor and outdoor spaces. The Samesay LED Bluetooth speaker has a minimalist and portable design with 7 kinds of LED lights. The speaker is designed to be portable and supports pairing with all Bluetooth-enabled devices with digital signal processing, as well as TF/SD card. We liked the fact that the speaker comes with built-in microphone which supports hands free calls, and automatically switches to hands-free mode when taking incoming calls. The entire speaker is designed to be portable and lightweight, and weighs a mere 180g with wireless stereo subwoofer functionality. It also features a 800mAh li-ion battery that provides 3-4 hours of continuous music playtime on a single charge. The Bluetooth 4.0 supports auto back-link and comes with a standard micro USB cable for charging. The LED colors on the speaker look visually stunning and have customizable patterns which adjust to different modes. The Verdict? The Samesay LED Bluetooth speaker with lights is a visually appealing LED speaker with quality sound performance. It comes with 7 LED visual modes with pre-programmed dynamic multi-color lights with nice flashing styles that provide a visually stunning appearance. The speaker has wireless Bluetooth 4.0 which is compatible with all Bluetooth-enabled devices including iPhone and android smartphone devices. It also has a good range of up to 33 feet. The Samesay speaker has an ultra-portable design with a lightweight body and weighs around 180g. It comes with a built-in battery with a 800mAh capacity and provides 4-5 hours of continuous music playtime at 50% volume. The speaker charges quickly through the micro USB cable and have a built-in microphone for hands free calls. On the whole, the Samesay LED Bluetooth speaker with lights provides good sound quality with visually stunning LED effects and comes highly recommended. The SHAVA LED Bluetooth speaker with lights is an all-in-one speaker that comes with touch control LED mood lamp, music player and hands-free speakerphone together with a table lamp. 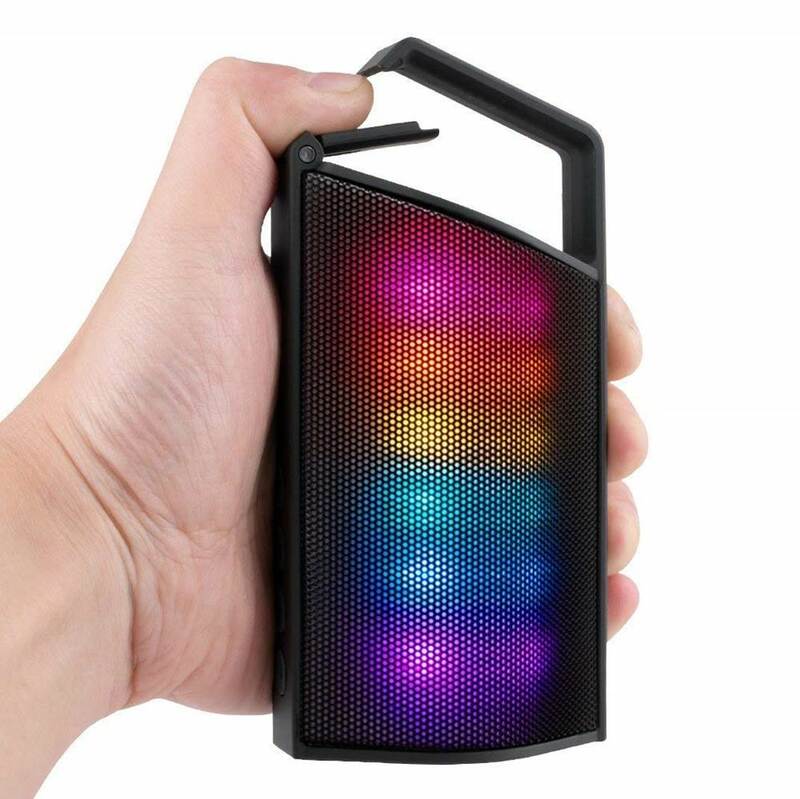 The entire speaker has a unique portable design with 6 RGB color light themes which are interchangeable by tapping the speaker mesh. The LED lights on the speaker flashes to the beat of the music and works really well with wireless Bluetooth streaming. The SHAVA speaker supports wireless Bluetooth as well as micro SD card and 3.5mm audio cable connection. It also comes with a built-in microphone which supports hands-free capability with noise cancellation software. The SHAVA speaker also comes with a packed 2000mAh battery which provides up to 8 hours of continuous music playtime on a single charge. We also liked the fact that the speaker comes with a specific instruction manual on how to change between color modes and operate the speaker. On the whole, the SHAVA LED Bluetooth speaker is a colorful and mesmerizing portable speaker that is worth checking out. The sound quality on the SHAVA LED Bluetooth speaker is nice and clear, and delivers good music quality with good attention to detail. The SHAVA speaker can pump out a surprising amount of volume and fill up a medium size room with rich sound without much distortion. The highs and midranges on the speaker are crisp and well-defined, and the bass output is decent. Music genres such as rock and pop sounded pretty punchy with good sound textures – the bass beats are vibrant and nicely reproduced, while the treble and timbre ranges were smooth and crisp. We also liked the fact that the sound clarity does not roll off at lower volume levels. The speaker is capable of visually stunning LED color patterns that dance to the beat of the music and cycle through different patterns. The SHAVA LED Bluetooth speaker has a sleek and minimalist design that is compact and easy to carry around. It also doubles as a touch LED mood lamp which looks really cool when placed inside the bedroom. The speaker comes with a 2” acoustic driver that provides rich and clear sound. It features 6 LED multi-color light themes with adjustable LED patterns and a touch sensor design at the top. The speaker can be used with auxiliary and TF card input and also has a built-in microphone for easy hands-free calls. The speaker has a portable design for use with party, travel and home use. We also liked the fact that it has a decent battery life of up to 8 hours and has a timing off function which helps to conserve battery. The Verdict? 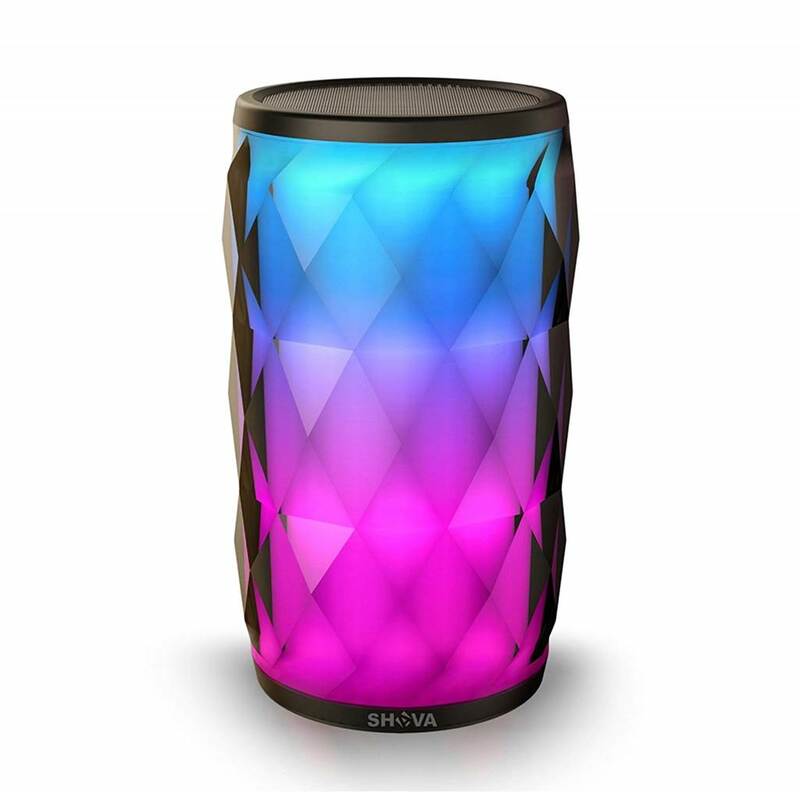 The SHAVA LED Bluetooth speaker with lights is a versatile speaker with 6 LED multi-color LEDs and visually stunning patterns. It has virtually everything you need in a portable speaker and supports auxiliary and TF card inputs as well. The speaker has 6 LED colors which cycle through and create a visually stunning display of color. The sound quality on the speaker is really crisp and clear and we thoroughly enjoyed listening to the speaker – you can also crank up the volume to maximum on the SHAVA speaker without hearing any distortion. The Bluetooth speaker comes with a built-in battery that provides up to 8 hours of continuous music playtime, and also has a built-in microphone for hands free and easy calls. It also comes with a portable design that is suitable for both indoor and outdoor use. On the whole, the SHAVA LED Bluetooth speaker with lights provides decent sound quality and a visually impactful display of LED lights, and we highly recommend them. The Greadio LED Bluetooth speaker with lights is a portable wireless speaker with a unique LED design that looks visually impactful and vibrant. The Greadio speaker supports all Bluetooth devices as well as micro SD memory card and auxiliary in. It is capable of delivering high-definition sound through a 5W full-range driver and provides great sound performance for both indoor and outdoor use. The Greadio speaker comes with a RGB color-changing LED light display and an integrated chipset that provides 6 different color-changing light patterns and display – we liked the fact that you can choose any color or change the lights to suit the music rhythm automatically. The speaker also comes with a high-quality 2000mAh li-ion battery that provides up to 10 hours of continuous music playtime with the LED lights turned off. The Greadio speaker also uses Bluetooth 4.0 which provides smooth wireless connectivity with a long range of up to 66 feet. The speaker comes with a USB charging cable and user manual for easy reference. Overall, the Greadio LED Bluetooth speaker with lights is a really sleek and versatile speaker that provides good sound quality with a stunning LED display. The sound quality on the Greadio speaker is great and produces enough volume to fill up a medium sized room without any issues. You can take the speaker indoors or outdoors without any problems and it also works off using the micro SD memory card. The sound performance that we got from the Greadio speaker is really crisp and crystal clear, with vibrant highs and smooth midranges. The bass response is decent although somewhat lacking due to the small size of the speaker. We liked the fact that you can crank up the volume on the Greadio speaker without hearing any distortion which is a nice added plus. Music genres such as rock, pop and hip-hop sound pretty punchy and clean and we thoroughly enjoyed the vibrant LED display that literally dances to the beat of the music. The LED colors that the Greadio speaker produces are vibrant and bright. We liked the unique design of this speaker and the LED colors cycle through different modes and patterns which gives it a unique display. The speaker itself is designed to be portable and lightweight, and comes with a high capacity 2000mAh battery that can provide up to 8 hours of playtime with the LED lights turned on. The Bluetooth functionality on the speaker works like a charm and we did not experience any lags or dips in sound quality while streaming music from our mobile device. The speaker uses Bluetooth 4.0 for wireless connection and has a range of up to 66 feet in unobstructed environment. The LED display looks really sleek with pulsating lights and makes for an entertaining visual experience. The Verdict? The Greadio speaker is one of the best LED Bluetooth speakers with lights and comes with a 5W full-range driver that provides crystal clear sound. The speaker is equipped with Bluetooth 4.0 for consistent Bluetooth streaming quality and supports all Bluetooth devices. It also has micro SD card memory and auxiliary inputs for non-wireless music sources. We particularly enjoyed the RGB color changing lights that the speaker has – it has an integrated chipset that cycles through 6 different color-changing themes and modes. We also liked the fact that it comes with a 2000mAh battery that provides a good 8 hours of playtime with the LED lights switched on. The speaker also comes with a USB cable and user manual for easy reference. Overall, the Greadio speaker is one of the best LED Bluetooth speakers with lights that we have tested and we enjoyed the music performance with vibrant and colorful LED displays. The ION Party LED Bluetooth speaker with lights is a compact speaker with dazzling LED lights and is perfect for outdoor pool parties or indoor use. The ION Party speaker has a very bright and dazzling LED lightshow display at the top which looks very stunning. The speaker projects pulsating multi-colored party lights onto the walls and ceilings for a full party effect. It also features an ultra-compact and portable speaker design that can produce crystal clear sound. The speaker supports wireless Bluetooth streaming from any Bluetooth device and works well with iPad, iPhone and android devices. It also comes with a long-lasting rechargeable battery that can provide many hours of continuous listening time on a single charge. The speaker also comes with a USB charging cable for easy charging. If you are looking for a stunning LED Bluetooth speaker with lights, the ION Party speaker is definitely a great choice. The sound quality on the ION Party speaker is crisp and clear. They have enough power to fill up a small room with music and pump out crystal clear audio performance. Music performances such as country folk and instrumental music sounded clear through the speaker, with detailed highs and subtle midranges. The bass performance on the ION Party speaker is decent although not as powerful as expected due to the small size of the speaker. We also played a variety of music genres on the ION speaker including disco, rock and hip-hop and they all sounded detailed and very clear. It can produce decent volume output without any distortion at maximum volume levels. The LED design on the ION party speaker is very unique and has a disco-like appearance with a nice light dispersion. The ION Party speaker is designed to be compact and portable and you can take it with you wherever you go without any issues. It comes with a long-lasting rechargeable battery with a USB charging cable. The speaker has Bluetooth connectivity which allows you to stream music wirelessly from any Bluetooth-enabled device. The speaker is also compatible with iPad, iPhone and android devices. We really enjoyed the pulsating multi-color lights that the speaker projects onto the walls and ceilings. The built-in battery life also provides a good 4-5 hours of music playtime on a single charge. The Verdict? The ION Party LED Bluetooth speaker with lights works really well for disco and party applications. It essentially doubles as a disco ball lighting with pulsating multi-colored LED lights that shines brightly onto the walls and ceilings. It is a compact speaker that delivers good wireless sound performance and has decent sound quality with crisp highs, detailed midranges and nice bass response. It can also pump out considerable volume, although it may produce some degree of distortion at close to maximum volumes. The speaker also has a built-in rechargeable battery and comes with a micro USB cable for easy charging. The wireless Bluetooth connectivity works like a charm and we did not experience any dips in sound quality as well. 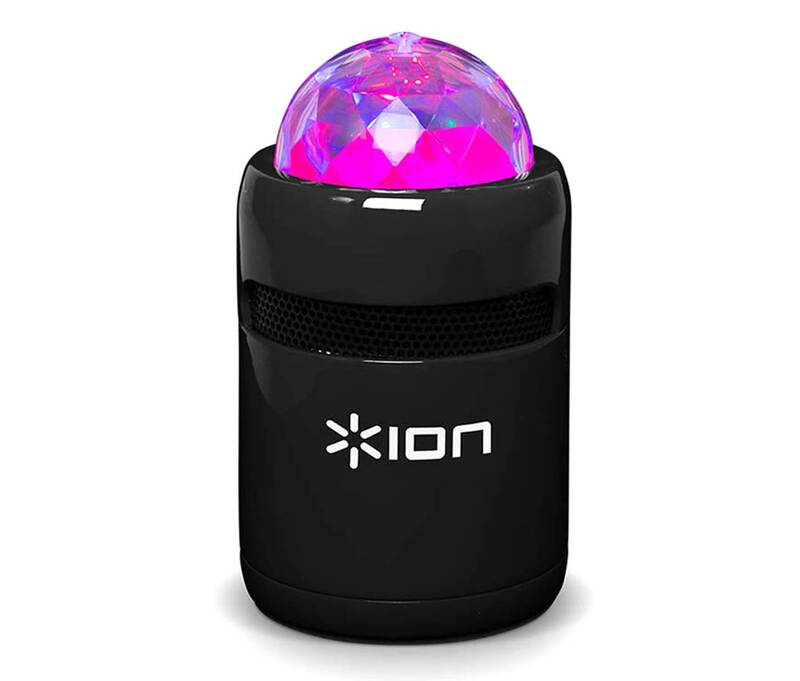 Overall, the ION Party speaker is a good LED Bluetooth speaker with lights that has a unique pulsating orb appearance at the top and we highly recommend them. The Nuvelon LED Bluetooth speaker with lights is a high-performance speaker that can deliver a full 15 watts of audio output with crystal clear sound. 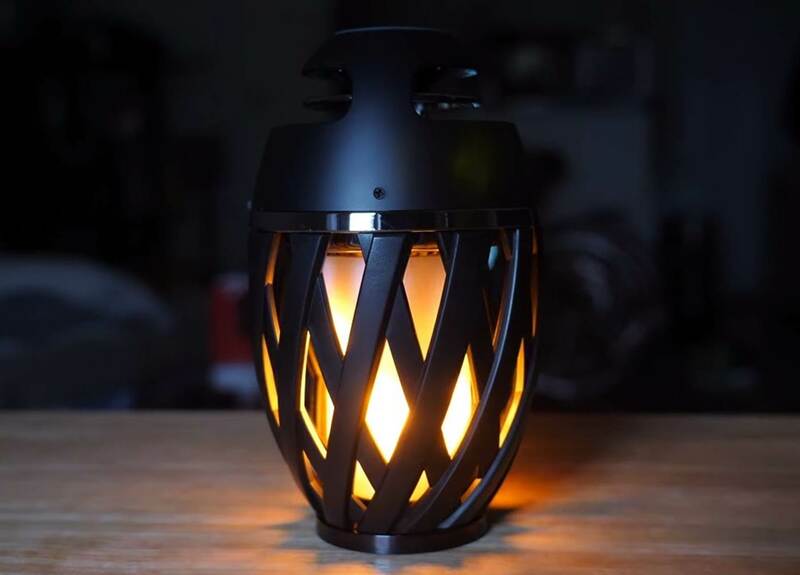 The speaker has a unique lantern shaped design with LED lightings that make it look really attractive. This Bluetooth speaker supports wireless pairing modes where you can sync multiple Nuvelon speakers together to create a wider soundstage. It is also IPX5 splash-proof rated which makes it ideal for use under wet outdoor conditions. The acoustic drivers on the speaker can produce good bass and audio, with 15 watts of pure audio sound and good soundstage. The Nuvelon features pulsating LED lights with range from calm serene glows to beat-pulsing rhythms that move to the beat of the music. We liked the fact that the speakers are equipped with a high capacity 6600mAh battery that recharges after 3 hours. It has enough power to provide up to 10 hours of continuous music playtime on a single charge. Overall, the Nuvelon Bluetooth speaker is a high-performance speaker that provides great sound quality with a visually stunning LED display and we highly recommend them. The sound performance of the Nuvelon speaker was much better than we expected – with crisp highs, detailed midranges and a surprisingly good bass response. They are easy to sync with your mobile Bluetooth device and can pump out crystal clear music performance without any distortion at high volume levels. Vocal performances and dialogue sounded smooth and crisp through the speaker, and we thoroughly enjoyed listening to music and streaming video audio through the Nuvelon speaker. The bass response on the speaker hits hard and sounds punch, and adds plenty of depth to music performances. We tested a variety of music genres on the speaker including rock, hip-hop and jazz and they sounded rich and full with vibrant details. The bass effect that this speaker produces is quite good and adds a layer of depth to the overall music quality. The Nuvelon speaker has a sleek and unique design that blends in nicely with modern home interior décor. The latern shape design is visually stunning and the LED visual effects are breath-taking. The LED colors change and cycle through multiple colors as you play music – the LED lights literally dance to the beat of the music. You can also connect multiple Nuvelon speakers together for a much wider soundstage. The wireless Bluetooth connectivity works like a charm and we did not have any issues connecting our mobile device to the speaker. The built-in battery life is a high capacity 6600 mAh and can deliver up to 10 hours of music playtime on a single charge with the LED lights turned on. It also features an automatic battery conversation mode where the speaker goes to sleep after five minutes if there is no Bluetooth connection. The speaker is relatively compact and easy to carry around, and is perfect for outdoor pool parties or gatherings. The Verdict? The Nuvelon speaker is one of the best LED Bluetooth speakers with lights that can deliver high-performance audio. The entire speaker is rated IPX5 splash-proof and can be used in outdoor open spaces. We liked the quality of the audio performance from the speaker – it can pump out 15 watts of pure sound with strong bass that punches deep. Music performances sounded crisp and lifelike through the speakers, and it delivers plenty of soundstage with good volume output. We also did not hear any distortion from the speaker at maximum volume which is a nice added bonus. The pulsating LED lights on the Nuvelon speaker are very vibrant and visually stunning – it produces a glow that syncs to the beat of the music and looks really stylish. It also comes with a 6600 mAh battery that delivers up to 10 hours of music playtime on a single charge. Overall, the Nuvelon speaker is one of the best LED Bluetooth speakers with lights and we highly recommend them if you are looking for a high-performance LED speaker.